Having to constantly shave hair from the face can be a chore for women. The Braun Facial Epilator will quickly and comfortably remove hair, leaving the face softer and smoother, for a longer length of time. The Braun epilator also comes with an attachable cleansing brush, and there is an extra brush refill included in the box. This epilator runs on a battery, and is cordless. It’s an affordable option to removing hair effectively from the face. 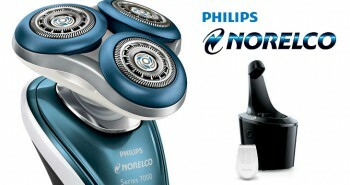 A facial epilator pulls hair up from the root, leaving the skin hair-free for up to four weeks. This is quite a time-saver for women who have thick hairs on the face that normally need to be removed once a day. Epilation can be a better choice for women than having to shave the face. A traditional razor blade may cause nicks and cuts that may be acceptable on a man’s face, but never a woman’s. An electric razor may work for the bottom of the face, but there is no way to get it around the eyebrows, or along the hairline. An epilator is also more effective than tweezers, as using tweezers can take a long time to remove hair from the face. An epilator is also a better choice than using depilatory creams, which smell bad and can cause skin irritation. Braun epilation can be done on hairs that are barely visible on the face, and don’t need to grow to a certain length to be tweezed out by regular tweezers. You can use your Braun epilator anywhere, and not need to make an expensive salon appointment for hair removal. 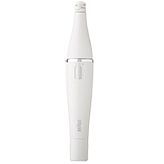 The Braun epilator is built with a slim head that allows for ultimate precision. All hairs are captured from the face and removed. 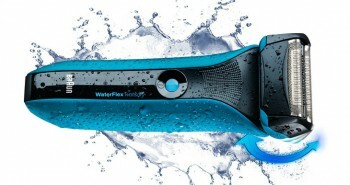 Using the facial cleansing brush is also six times better than manual cleansing with a wash cloth. Dirt and grime will be removed from pores, decreasing black head build up. 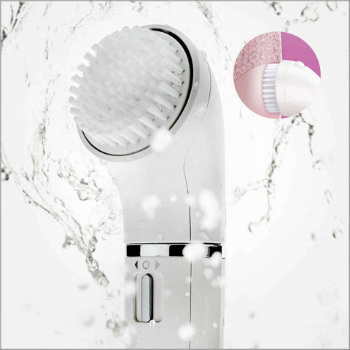 The Braun company created the world’s first combined epilator and facial cleansing brush in one. 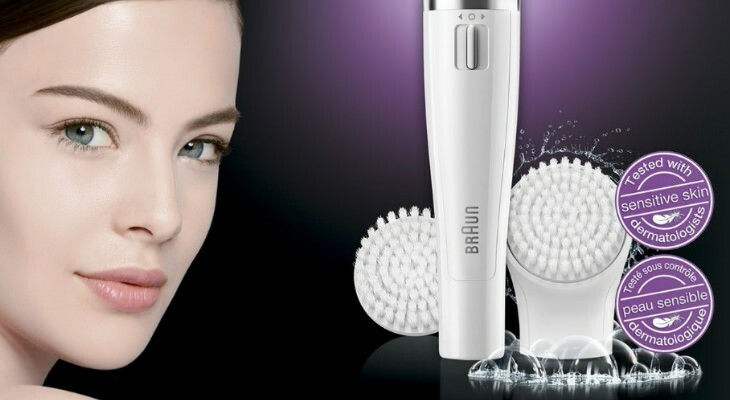 After removing the hair from your face, and using the cleansing brush, your face will be glowing. It’s like two treatments in one. Makeup, dirt, and cell debris can clog up your pores over time. The brush allows for gentle pore cleansing, to get the crud out, that can cause blocked pores and blemishes. You’ll be able to remove makeup and impurities, right down to the pores. The cleansing brush also serves the dual purpose of being an exfoliator, to remove dead skin cells from the surface of the skin. With hundreds of micro-oscillations per minute, the cleansing brush gently cleans, even on the most sensitive skin. The Braun epilator removes the thickest hairs, and even the tiny fine ones that you can’t easily see. There are ten micro openings on its surface, to grasp all hairs. These micro openings measure just 0.02 millimeters. These openings act like mini tweezers. The ten tweezers capture hairs that are 0.02 millimeters wide, and 0.05 millimeters long. There’s no need to wait for hairs to be grown long enough to be visible. They can be removed before then. Hairs can easily be removed from forehead, brow line, checks, chin, upper lip, and jawline. 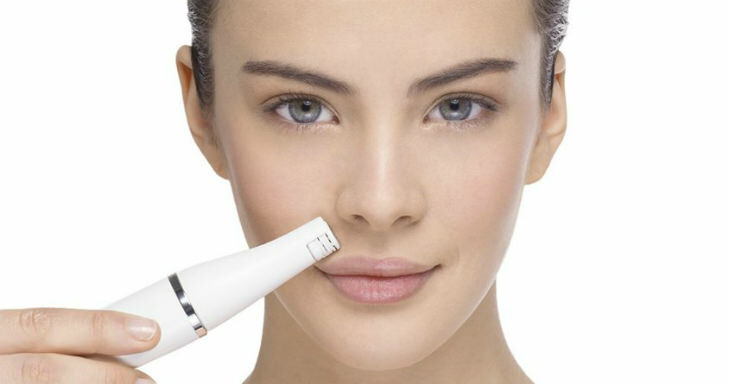 The epilator will flow over every contour of the face, but still be effective for flat regions as well. Hair will be quickly removed, so you can get on with your morning routine. You’ll only need to use your epilator once every four weeks, to achieve optimum beauty. The Braun epilator works with high-frequency plucking. There are 200 plucking movements per second. It only takes seconds to remove all the extraneous hairs on your face. There is a bidirectional switch on the Braun epilator, so that you can effectively epilate on both sides of the face. The Braun epilator can be used in the sink, or the shower. It can also be used with water, soap, cleansing milk, liquid soap, facial scrub, and other types of shaving gels and foams. One of the great benefits of using a Braun facial epilator is that it can also be used on eyebrows: above, below, or to the sides. 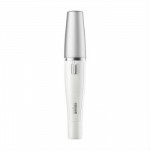 To start using the Braun epilator, start between the eyebrows, then move to the upper lip area, then around the mouth and jawline. The best time to epilate is in the evening, so that if there is any lingering redness, it will disappear by the time you awake in the morning. When you’re done epilating, simple rinse your Braun epilator under warm tap water, shake out the water, and let air dry. To use the Braun cleansing brush, you can use it with water, and soap, and lotions. Start at the forehead and work your way down the face. Spend more time cleaning oily regions. The brush is also gentle enough to be used on the neck and decollete regions. 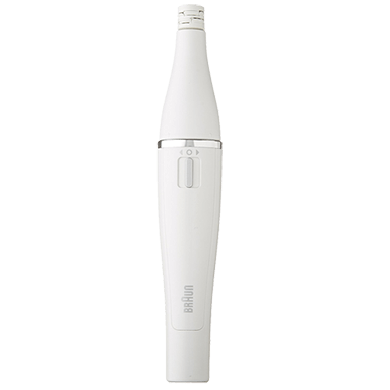 The Braun epilator looks a lot like an electric toothbrush, with a slim head design, and you can keep it on the counter, and no one will be the wiser that you actually use it on your face. The outer casing is smooth white, with attractive silver banding. There is an easy-to-reach on and off button. The epilator is easy to hold in the hand, and was designed for extreme precision that you just can’t get with a standard electric shaver on its own. 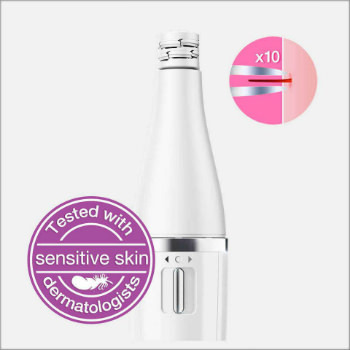 The epilator measures 6.1 x 2.2 x 8.7 inches, and weighs a light 9.6 ounces. Inside the box you’ll receive one white Braun epilator, a brush head, one brush refill, a small cleaning brush, an AA battery, and a cap to protect the tip of the epilator. The Braun epilator serves a dual purpose in removing hair from the skin, and can be used as an effective cleansing brush as well. It’s gentle enough to use on most types of skin, and is more effective at removing facial hair than other traditional shaving methods.